Adding Autostar GOTO functionality to your existing telescope. My first Autostar conversion effort, motors sticking straight out from the worm drives and in the way. I machined an aluminum spacer for the right ascension axis (you can see it between the lower motor bracket and the declination axis housing above. Look for the red arrow). It prevented the optical ring base from hitting the lower-motor during slews past that critical point in the mount. Click on the picture for more info. I have had a lot of fun and frustration trying to upgrade my existing telescopes to full GOTO (a.k.a. roboscope) capability. Over the years I bought the books, read the books, played with servo motors, stepper motors and optical encoders. I also purchased all kinds of astronomy software. In the end, I was frustrated with everything I found and everything I tried. When the ETX-90EC was announced, I called Meade customer support and asked if I could just buy the GOTO mount for my existing Meade 2045 100mm SCT scope. The answer from the support person was not "no", it was HELL NO, YOU'RE WASTING MY TIME and then he hung up on me. Unsettling to say the least! In all fairness I am sure that his attitude did not and does not represent Meade as a company. And then it happened! Meade announced the DS-series of telescopes with external motors. 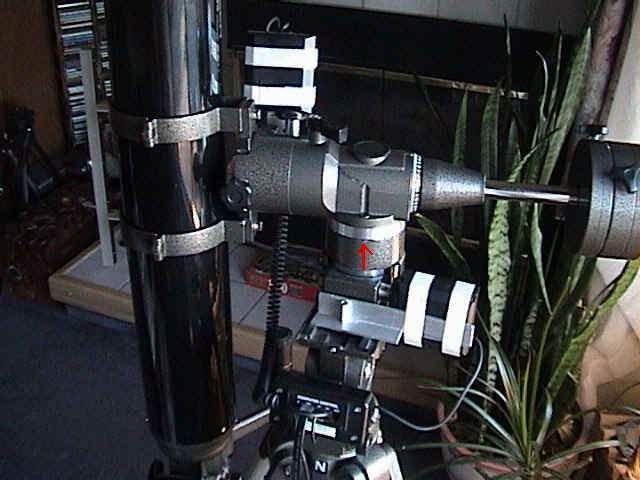 I started a search to find out if anyone had tried to bolt the DS-series motors to other telescope mounts. Eventually I found Mike Weasner's awesome ETX web site, www.weasner.com/etx/menu.html. What a gold mine! 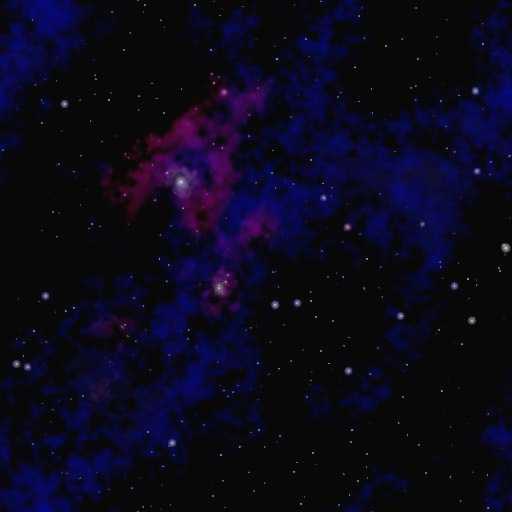 From there, I found Steve Bedair's website, http://bedair.org/ScopeStuff.html. Incredible! My creative juices really started flowing! From Steve's site, I found Peter Wallner's web site, http://members.aon.at/wallnerstelescopes/. Another home run! I quickly hobbled together a setup similar to Peter's Celestron C8 setup, with aluminum angle pieces, fiberglass strapping tape and all. I had to do a little bit of minor machining to create a mount spacer and two adapter shafts for the plastic Meade gears to connect to the worms of my CG-5/EQ-4 mount under my 120mm f8 Bresser (Synta) Pulsar refractor telescope. By using the gear ratio information from Steve's site, I set everything up and started to play. Right away I ran into problems. The stupid thing seemed to have a mind of it's own! No matter how much troubleshooting of cables, connectors, power supplies, Autostar firmware changes, different Autostars, different versions of Autostars, different experimental gear ratios and whatever else I could think of, the damn thing suffered from seemingly random slews at unpredictable times. I was almost to the point of giving up and finding a Vixen SkySensor 2000-PC. And then one day I was exploring Mikes expansive ETX site for the 1,000th time and I found a message from Tony George about the very problem I was having and how he fixed it with a capacitor and a resistor on the DS motor. I went ahead and opened my DS motors for the 500th time and added the two new parts. IT WORKED! Oh Happy Day! My scope now behaved just like it should have from day-one of the conversion. With that problem behind me, I charged forward with my next idea, creating a "no-modifications" adapter kit that would allow owners of CG-3 to CG-5, EQ-4, EQ-5, HD, Vixen Great Polaris (GP, GP-E, GP-DX, SP, SP-DX, etc.) and other compatible clone German Equatorial Mounted (a.k.a. GEM) telescopes to be retrofitted with Autostar functionality. In all fairness, I should state that I believe that the Vixen SkySensor 2000-PC GOTO system for these mounts is probably a superior system in terms of suitability for astrophotography. The Vixen system has a higher angular resolution and also supports standard autoguider feedback without additional hardware But having said all of that, the Meade Autostar system is incredibly-friendly, CHEAP and popular world-wide. Adding one of the Meade DSI cameras and using Autostar Suite does give the Autostar autoguiding capabilities. As does using the Meade #909 APM module with the latest Meade Autostar firmware images. Anyway, I have completed a technical document for my Gen-1 "no-modification" GP-type mount adapter kit for the Autostar. 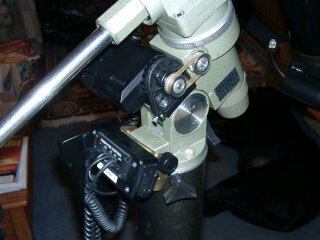 It allows an owner of a GP-type telescope mount to take the Meade DS-series telescope Autostar upgrade kit (Meade part number #493) and a few basic additional parts and upgrade their telescope to full Autostar GOTO capability. I have made the instructions freely available for download from this web page. Meade has discontinued the original DS-series of telescopes with the external motors. I expect that the #492 and #493 kits may eventually become rather hard to find. I would suggest to anyone who thinks that they might want to try adding Autostar capability to their own telescopes someday to go ahead and purchase one or more of the #492 or #493 kits now as an investment in their future. If they really do become hard to find, you might be glad that you did. If you end up not using them, I suspect that they will retain their value quite well on eBay and other auction sites. So do you want to try to convert your Vixen-style GEM mount to Autostar GOTO? Left-click to read, right-click to save PDF file to your PC. Gen-2 bracket kits were available for a number of years from http://www.goto4all.de but have since been discontinued. And now for the Anchorage, Alaska Clear Sky Clock!